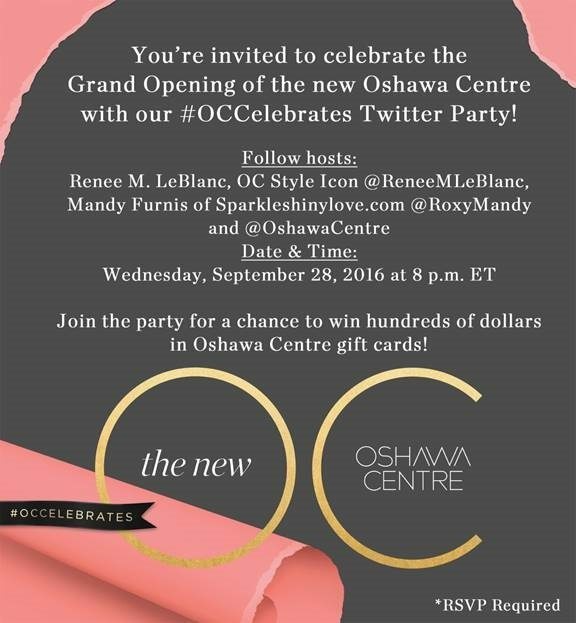 Join us for the #OCCelebrates Twitter Party! I don’t know about you, but I am getting so excited about the Oshawa Centre expansion! They are celebrating with their Grand Opening from September 29th until October 2nd, and I can’t wait to shop all of the new stores opening at the mall! The new expansion includes 60 new stores, a new 1000 seat food court, and two new restaurants! To get ready for the big celebration we are having a huge Twitter party! Join us on September 28th at 8pm EST to talk all about fall fashions, shopping the new stores at the Oshawa Centre, and so much more! Hosts: Moi @RoxyMandy, @reneemleblanc and of course @OshawaCentre on Twitter! What can you win? One of 5 x $100 Oshawa Centre Gift Cards and one Grand Prize of a $500 OC gift card! These prizes are open to residents of Canada to win! RSVP: You must RSVP, and please do so below! I’m so excited to party with you on September 28th! RSVP below so you don’t miss out. Previous Post Closet Renovation Progress Update!